When reading our reviews, the box you see at the top of a review (see example above) is a blended rating, which includes factoring in unique gluten-free issues as well as traditional review criteria. For a more detailed approach to restaurants, each review additionally provides a restaurant review as well as a separate gluten-free review (see image below), with the overall rating box being a blend of these two review aspects. While we purchase many of the products we taste for reviews, we also accept free products to try. However, there is a clear understanding with vendors that–good or bad–we will share our views. Following along our restaurant review criteria, travel accommodations are not comped, and we never announce we are visiting an establishment to write a review. The goal of Gluten-Free Foodies Review is to make gluten-free living the best it can be for as many people as possible. 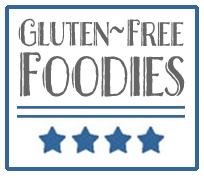 Our strict review criteria for writers is just one way we ensure the quality and accuracy of the content shared with our community of gluten-free foodies. Important Note: We believe it is not the sole responsibility of the restaurant to ensure an enjoyable meal out. For that reason, we have recommendations for gluten-free diners on how to communicate with restaurant staff when eating out. It is recommended you read to increase the chance of a pleasurable dining experience. There are never any guarantees when we dine out, but at least we can try to the best experience possible. Gluten Free Trend: Helping or Hurting the Community?